We’ve had quite a few requests for skincare suggestions for women over 60 and 70, and we think we’ve found the perfect range. The Nivea Hyaluron Cellular Filler Elasticity & Re-Densifying range is specifically designed to maximise firmness and hydration in more mature skin. Production of hyaluronic acid, collagen, and elastin all slow down as we age, and it is these three key skin components that help our skin stay looking fresh and youthful. 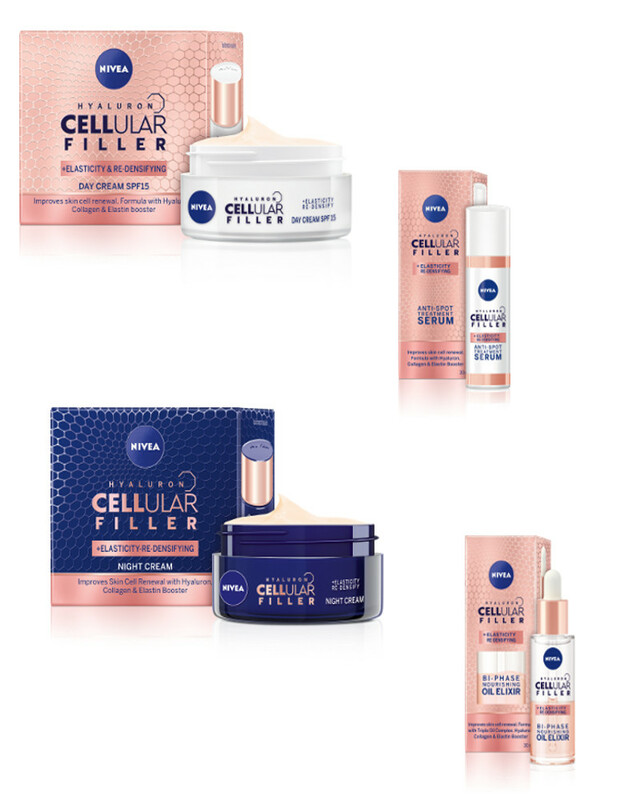 The Nivea Hyaluron Cellular Filler Elasticity & Re-Densifying range of products work to encourage your skin to keep generating its own hyaluronic acid, collagen and elastin, helping to reduce the signs of ageing. The range is designed to be used from around the age of 60, however it can be used from your 50’s if you are starting to see the tell-tale signs of loss of contour, loss of elasticity, loss of strength and firmness, loss of moisture, wrinkles and lines and the development of age spots. The range consists of 4 simple to use products. The lightweight, easily absorbed Nivea Hyaluron Cellular Filler Elasticity & Re-Densifying Day Cream SPF 15 contains hyaluronic acid, collagen booster, and elastin booster, to help encourage cell renewal in mature skin, resulting in improved skin elasticity when used over time. The intense boost of moisture leaves your skin looking smooth and silky, and it feels wonderfully soft. The addition of SPF 15 helps to prevent UV induced ageing and age spots. 50ml RRP $32.99. The Nivea Hyaluron Cellular Filler Elasticity & Re-Densifying Night Cream contains the same cell-activating ingredients of hyaluronic acid, collagen booster, and elastin booster, to help encourage cell renewal while you sleep through the night, and the addition of shea butter provides a luxurious moisture boost, so you awaken to softer, nourished, rejuvenated feeling skin. 50ml RRP $32.99. The Nivea Hyaluron Cellular Filler Elasticity & Re-Densifying Anti-Spot Treatment Serum contains a highly effective anti-pigment technology to help reduce the appearance of existing age spots, and even out skin tone. The fast-absorbing serum, also containing hyaluronic acid, collagen booster, and elastin booster, can be used on cleansed face, décolletage and hands ahead of either the day or night cream. 30ml RRP $34.99. Rounding out the collection in the Nivea Hyaluron Cellular Filler Elasticity & Re-Densifying Bi-Phase Nourishing Oil Elixir, is an innovative weightless formula developed especially for mature skin, with a triple-oil complex do deeply nourish skin, and a highly concentrated aqueous component, containing the hyaluronic acid, collagen booster and elastin booster, to keep your skin moisturised. Suitable for all skin types except very oily. The bi-phase oil is used on cleansed skin, ahead of either the day or night cream. 30ml RRP $34.99.